Wheeee! It’s time!! Let’s do this thing! Welcome to the July 2017 edition of #24in48! Right now, it’s midnight ET on the official readathon clock, but we’re kicking things off with a bang. If you’re just now discovering the ‘thon or have been unsure of your weekend plans, you can still sign up and do so throughout the weekend. Lots of helpful information on tracking your time and other tips for readathon success can be found here. You’ll want those tips, I promise. Speaking of tracking, if you’re planning on reading a full 24 hours (or even just trying to get close), make sure you track your time. You can do this a number of ways but the preferred method is with a stopwatch on your phone or computer or the Bookout app for iOS devices. If you finish 24 hours of reading, you’ll be eligible to win one of four prize packs, including one just for non-US participants. There is ZERO pressure to read for a full 24 hours. Seriously, guys. This is the fifth year I’ve been doing this thing, and I say every time, this is supposed to be fun and low pressure. The goal is to set aside some serious time to read with other like-minded readers. Take a break, get some sleep, eat well. This is a marathon, not a sprint. Make sure that your sign-up entry is correct (including email and social media/blog URL). If you’re not active on that social platform during the ‘thon, you won’t be able to win any of the amazing prizes we’re giving away. By URL I mean, don’t just type “Twitter” or “Facebook.” I need to be able to find you, so list your username or the URL of your feed (i.e. http://twitter.com/24in48readathon). If you need to update your entry, you can do so by going through the link you received in your confirmation email. If you didn’t get an email and need to update your entry, email me ASAP at 24in48readathonofficial@gmail.com. If your name is announced as either a door prize winner or a challenge winner, go over to the Prize page and fill out the form. If you don’t check in there, you’ll miss your shot to win. Follow the conversation (which honestly is my favorite part of the ‘thon) on social media. 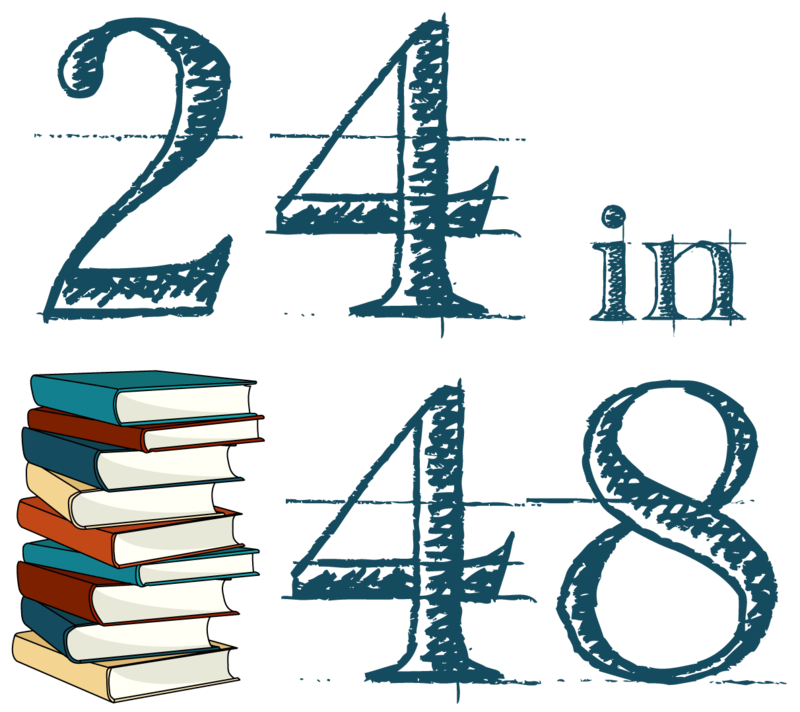 I’ll be posting from @24in48readathon on Twitter, on the official Facebook page, and @24in48 on Instagram and Litsy. You can – and should – use the official hashtag #24in48 everywhere as well. We’ll be posting here every three hours with challenges and door prize giveaways, so check in early and often. Four people who complete the survey will win their choice of prize. You have until the midway point, Hour 24 at midnight ET tonight, to enter. My friend recommended it to me. 1. Reading from California, USA! 2. This is my first readathon ever. I’m not sure if I’ll make it to the full 24, but I’ve been having a blast so far. 5. I’m a college student, fencer, and writer and I’m just happy it’s summer so I have actual time to read for fun. 1. Indiana! Both Bloomington and Indy! 2. I have not participated in this particular 24 in 48 style readathon. I’m jazzed! 3. I’m a member of the Shadow Lounge Readathon group on Facebook, and someone posted about this Readathon. Exciting! 4. I’m most of the way through The Shadow Land, Elizabeth Kostova’s book that just came out in April. It’s incredibly riveting thusfar, and I can’t wait to finish it. 5. I’m a recent MLS graduate and trying to get a job at a public library. I have three kitties and a puppy who might make appearances in my pictures posts this weekend. 6. My handle on Insta and Twitter is @paigesquared ! What book are you most excited about reading this weekend? I’ve just bought a fantasy book of the pathfinder tales and I can’t wait to read it! 2. This is my second one! 3. I learned of it through Litsy. 4. I can’t wait to finish Final Girls! No I havnt! I’m so excited to be doing this for the first time! I heard about it on another blog but I don’t remember which blog. I love to go to concerts and see my favorite artists live! Have you done the 24in48 readathon before? Nope and it has been slow to start today. Got a very slow start today on reading, I woke up in a bad mood. Then had to do hours of running around. It looks like I am going to be reading late into the night to catch up. Coffee is going to be my friend. it’s my first readathon. I found it on instagram yesterday. kinda winging it. I have a ton of TBR. i’m a longtime music critic. getting old for the scene though. my birthday is in two weeks and I’m dreading it. that much closer to 50. eek. I have a masters in journalism. looking for FT work. volunteer at an animal shelter. 3. Heard about it on Litsy of course! 4. Excited to read My Favorite Thing is Monsters! 5. @sydsavvy on Litsy, Instagram and Twitter — my college age daughter, in for a tiny bit before going back to school, wanted me to hang with her at the pool today so I totally failed on my first reading day. Only about 6 hours so far, but I regret nothing! 3. On Litsy of course! 5. I’m not much for knick knacks, but I collect old vintage cameras. I think it was in the Dewey’s Readathon Facebook group! I think Women Who Run With the Wolves will take up my whole weekend, but I wouldn’t mind starting Career Of Evil. I have one bookish tattoo. I’m on Twitter and Snapchat as @vinylcut. Will probably only post once on Instagram tonight also under @vinylcut. Have you done the 24in48 readathon before? No this is my first time ! 1. Reading from someone else’s house in Denton TX! 2. First time trying this challenge. 3. My writing group friend @_coffeesnob_ told us about it. 4. Most excited about my reread of Maggie Stiefvater’s Raven Cycle series. 2) First time participating in any readathon! 3) From bloggers and booktube. 4) A Well of Ascension by Brandon Sanderson and Chernobyl by Svetlana Alexievich. 5) I buy insane amount of books and then cry cause I’ve no control. When Dimple Met Rishi- which I just finished today! prompt us where to find you online this weekend. unrestrained to study My Favorite Thing is Monsters! cue us where to ascertain you online this weekend. What record book are you most delirious about reading this weekend?